The four photographs below are all from the same image of Eigg, the Hebridean island my office looks out to. As the sun is now moving South the early light is beginning to strike Eigg more from the side and bring out some of the texture of its Northern cliffs. Yesterday morning the climatic cloud and also the local cloud over Eigg combined to become a key part of the scene. I took five shots over a ten minute period as a shaft of sun light spread across the scene. All the images were stopped down by 2/3 to bring out more of the cloud detail, exposure taken on sunlit rock. In choosing this particular image I then wanted to highlight through post production some of what I was seeing. 1. - The image as viewed out of the camera with a little clarity added and haze removed. 2. 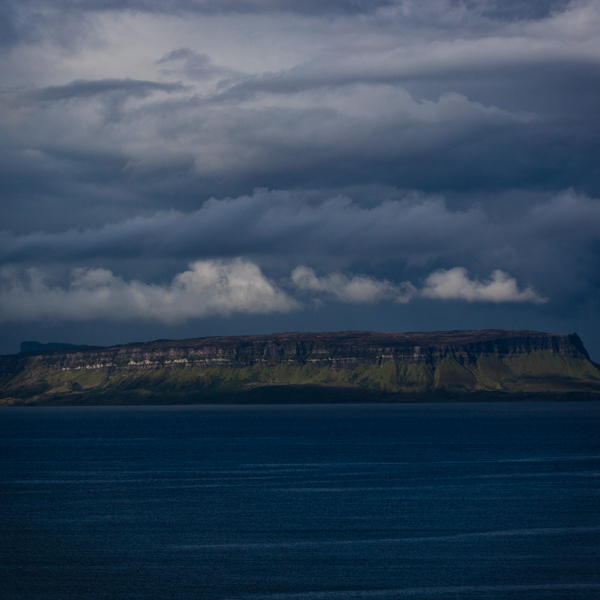 - Adding a small amount of vignette and a little contrast & vibrancy to accentuate the layering in both Eigg and the cloud. 3. - The same thought process as image 1 but in B&W as I believe the scene lends itself well to monochrome although it is rare that I process in black and white. 4. - Again using contrast in B&W to bring out the layering.